The House Budget Committee proposal to raise the caps on discretionary spending would add over $2 trillion in projected debt over the next decade, cost as much as the 2017 tax cuts, and increase spending twice as much as sequester repeal. It would also increase base discretionary spending to record levels in inflation-adjusted dollars. After increasing nominal base discretionary spending by 16 percent between 2017 and 2019 under the Bipartisan Budget Act (BBA) of 2018, the House bill would increase it an additional 7 percentage points through 2021. On an inflation adjusted basis, that would bring discretionary levels to a new high. (Comparisons go back to 1976, after the passage of the Congressional Budget and Impoundment Control Act of 1974). 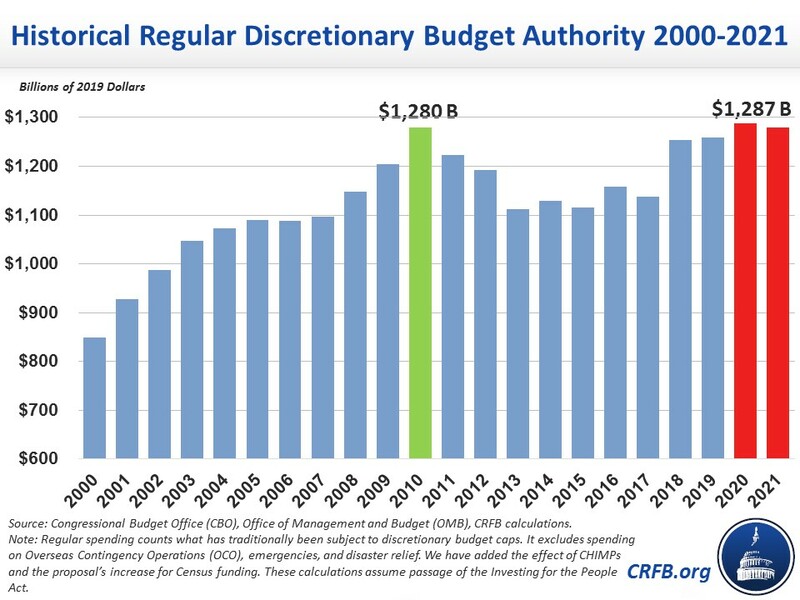 Assuming appropriators continue to rely on CHIMPS and fund the Census using the bill's new allowance, 2020 discretionary spending will reach $1.29 trillion in today's dollars - above the prior record of $1.28 trillion set in 2010. As we've explained, 2010 "represented both a high water mark for discretionary spending and an anomaly, driven in part by a new majority, stimulus enacted through the appropriations process, and decennial census funding." The Census repeats in 2020, but the economy is much stronger than in 2010. Indeed, discretionary spending in 2010 was so high that both parties proposed reductions and ultimately agreed to the Budget Control Act, which established the discretionary spending caps in the first place. The House bill would bring spending back to those very high levels. Looking separately at defense and non-defense tells a similar story. Under this bill, FY 2020 base non-defense spending would be the highest in recorded history and defense spending would be the third highest since the Budget Act. Even as a share of GDP (which is not necessarily the right way to measure - see box 1), base defense and non-defense appropriations would both total about 3 percent of GDP, in line with averages over the last two or three decades. While few lawmakers want to see discretionary spending fall by 10 percent due to a return to sequester-levels caps, that doesn't mean discretionary spending should be increased to new records. If lawmakers do support this level of discretionary spending, they should budget for the increases – identifying tradeoffs in the form of offsets of new revenue or other spending cuts to pay for this proposal. Otherwise, this will just be another $2 trillion added to the debt and financed by future generations. Now is not the time for lawmakers to add more to the debt with large increases in unpaid-for spending.